Mr. Obang Metho speaks to Ethiopian Muslims in Washington DC about the widespread human rights violations in Ethiopia and the need for justice, freedom, tolerance, mutual respect and human dignity. I would like to thanks First Hijraha Foundation for inviting me to speak to you today on the very important topic of human rights. It is good to be here with all of you. I also thanks the First Hijraha Foundation, UEM-PMSG, Risala Intentional and Oromo Muslims Foundation for this very nice and meaningful plaque, you have just given to me, acknowledging the work the SMNE has done for Ethiopian Muslims. I am honored to receive it in behalf of the SMNE; however, I also believe we have only done our job. In speaking up for you and other Ethiopians who are suffering and at risk of abuses, we believe we are only assuming our God-given responsibility. This is at the heart of our mission. We hope this principle will permeate into the fabric of Ethiopian society so as to establish a culture of respect, care, and love that embraces all Ethiopians. When the Anuak, my own ethnic group, suffered horrific human rights abuses at the hand of the current ethnic apartheid regime of the TPLF/EPRDF, we formed the Anuak Justice Council and initially spoke out for the Anuak, but early on, we learned of human rights abuses throughout the country. When the same kinds of abuses were perpetrated against Ethiopian Muslims, we felt we had to speak out for you also. Eventually, we broadened our mission to all Ethiopians and beyond. I am glad you have been the beneficiary of that. This plaque is not only for me, but is also for others in the SMNE who have joined together to advocate for the human rights of others. The title of my talk today is: Human Rights for Human Beings. Before addressing the problem of human rights violations in Ethiopia and how it might be solved, I would like to ask you a question to start us thinking more deeply on this topic. When you look at the stage, what do you see? Some of you will say you are seeing Obang, because the brother who just introduced me, started with my name, Obang. Now assume you did not know that name; in that case, what would you say then? You might say you see a man, a black man, a man in a suit, a man standing before you with a bald head, or some other category of definition. You might know where I came from, my ethnicity, my beliefs, or about my work. That might all be correct, but what transcends it all? What is the bigger picture of what you see? It is that you are seeing a human being. That human being can be identified in many ways, but above all, you are still seeing a human being. If you ask anyone—from any country, any race, from any ethnicity, from any religion or from any political group—the answer will remain the same. What they see is a human being. So when we talk about human rights, we are talking about rights for human beings. Human beings in every culture are the most precious being. These human beings have God-given sacred and inalienable rights that must be protected. When anybody violates those rights, it is called a violation of human rights. That is why it is the duty of all of us to protect and defend those rights regardless of the attributes or beliefs of any person. That is why when the Muslim leaders were put in jail in Ethiopia for simply opposing illegal government interference in their religious affairs;we in the SMNE spoke out in behalf of them because their “human” rights had been violated. We must see the humanity before all other distinctions. The people who organized and sponsored this event are fighting for one of the most basic and principle human rights:the right to religious freedom—the freedom to follow one’s beliefs, practices and conscience without interference from the government. The present regime’s failure to respect this basic God-given right has led to government control in the religious affairs of Ethiopian Muslims, to repression of the peaceful and legal attempt to correct this injustice, to the arrest and conviction of many religious leaders in a perversion of the Ethiopian Constitution and rule of law, and to widespread human rights abuses that include harassment, beatings, torture and death to some.Because of this, you chose to invite me, but when you did, you asked me to speak not only about the violation of religious rights of Ethiopian Muslims; but also about the violation of all kinds of human rights in Ethiopia—giving me a bigger responsibility—but also giving evidence of your bigger view about caring about the rights of all Ethiopians. In the past, we Ethiopians suffered or fought against injustice within our own groups while others ignored our pain. For example, when the Anuak were killed, no one cried for the Anuak except the Anuak. The same has been true for countless others! 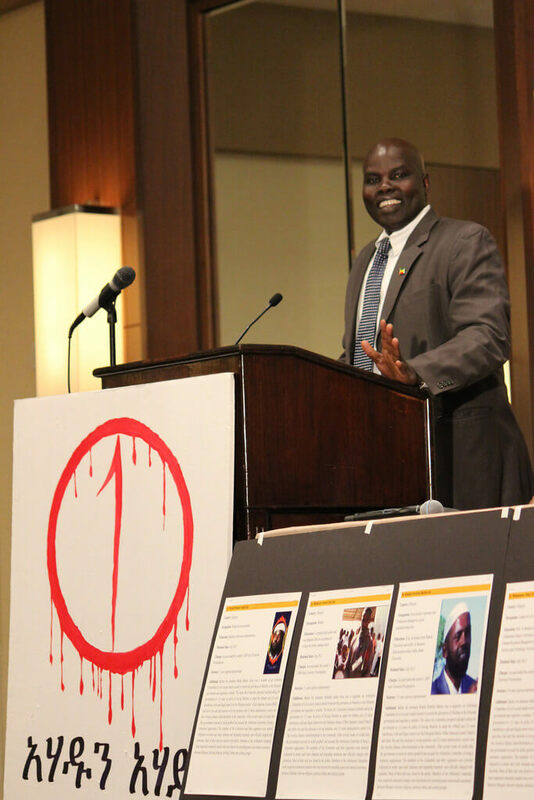 In 2007, when I was the director of the Anuak Justice Council I learned about the horrific human rights atrocities and destruction being carried out by the same Ethiopian regime that terrorized the Anuak in Gambella nearly four years before doing the same to Ethiopian Somalis. That is when we first connected with them so as to combine our voices against such injustice. Yet, we Ethiopians still are suffering injustice and part of the reason is we still have to do a better job in standing together for the rights of all. The questions to be answered include: what are human rights, what is the basis for them, who qualifies for them, how are they being violated and what should be done? To more deeply define human rights we must look at both words—human and rights? We must turn to the One who created us as human beings in the first place for the answer. Without God, there is no foundation for the rights of any of us. However, because He created us in His image, breathed life into us, and saw this life as being precious, we have been given intrinsic worth, value and dignity. We have even been given freedom to choose God and His ways or to reject Him and His ways. There are benefits or consequences to our choices, not only for ourselves, but also for those around us. As a Christian believer, I will use the example of what I know. Cain, perpetrated the first human rights violation against his brother, Abel. He hid it and refused to acknowledge his wrongdoing. He rejected the God-given value of his brother’s life and chose his own self-interests above God’s way. However, his life did not improve; but instead, he began a restless, lonely, and fear-filled journey to a land where he did not want to go. He first thought his life would be better with his brother gone, but it did not work that way. In taking his brother’s life, he became obsessed with fear for his own life. He became a captive to his own self-destructive choices. God gave him a way back, but he did not take it. How are perpetrators of human rights violations in Ethiopia making the same mistakes? How can Ethiopians restore the God-given value, dignity, rights and freedom of every human life in our country? How can those who have chosen to violate the human rights of others find a “way” back? How can amends be made? How can human rights mean rights for all human beings and how can we care about others when their rights are violated? How can we as a society find healing, justice and reconciliation? How can the soul of Ethiopia be revived? The kinds of violations of human rights seen in Ethiopia bring suffering to a broad range of people in different places and in different ways. Look at the following picture of our Ethiopian people of conscience who have been imprisoned. You can see their humanity better by seeing them as loving fathers to their children. They are now separated from their children and their families. These families have been robbed of their fathers and husbands. Would you only pick one to be reunited with their families and forget about the others because they are not part of your own group? This is not a lasting solution and is a symptom of a hardened heart. The moral call is to all of them so they might be reunited with their families for no one is free until all are free. As you know, such violations can target individuals, collective groups, ethnicities, religions, professions, political groups, institutions, and regions. We have seen the current regime attempt to control any who are perceived to be a threat to them—religious leaders, political leaders, journalists, bloggers, farmers defending their land, students protesting for a better education system, and regional groups who want freedom. In other words, human rights violations come in many different shapes and forms. All of the victims of these are basically asking for the same thing—that their God-given rights be respected; however, any resistance to the regime is seen as a threat to their control and results in human rights abuses, beatings, arrests, imprisonment or even death. The ethnic apartheid regime in Ethiopia fears the people if they let down their guard for even a moment. They have become prisoners of their own self-interest and their failure to acknowledge the God-given humanity in others, just like Cain. In Ethiopia, the regime is the main perpetrator of human rights violations in every region of the country. What is really worth questioning is why all of those experiencing human rights violations have failed to stand together as one to confront one opponent. That is what is missing in this country. When it came to others, no one responded. Let us apply this to the case of Ethiopia, replacing the groups with our own—the Amhara, the Oromo, the Afar, the Somali, the Tigrayan, someone from a minority ethnic group, Muslim leaders, Christian leaders or journalists. For example, when the TPLF/EPRDF first came into power, they targeted their own people who opposed their idea, then it was the Amhara, the religious leaders, intellectuals, professors, the students who protested and so on. The regime knows the power of unity and works against people standing together as one. They know they job is to divide and conquer in order to weaken resistance. This is not a new tactic but has been the ugly part of our human nature since the beginning of times. What is more surprising is how difficult it has been for the people of Ethiopia to realize that the only way to change things is to cooperate together for a more inclusive vision for all Ethiopian human beings. This is not about competing for rights. If one group obtains their rights it does not mean that their struggle should be over. This has been our problem. Even though we should have been unified by the violations, hardship, and exclusionary policies we all experience; instead, many continue to with a very limited vision that will only maintain the status quo. What is missing is a bigger vision to stand together as one in order to bring lasting change. That change means we must respect the dignity and preciousness of every human life. This is not so because it is a resolution passed by the United Nations or as some manmade law, but it is inherited in the DNA of being born human. It is a not dependent on some passing cultural value that comes in and out of popularity and acceptance. It does not depend upon who is in power or what “works” for the moment. It is not invented by some group nor was it given out in recognition of some achievement, affiliation, beauty or favorable connection. It is not reserved to one ethnic group, nationality, religion or viewpoint. It cannot be bought or lost, but it is a God-given universal principle that is an intrinsic part of being a human being. As a result, we have a responsibility to nurture, guard and protect the intrinsic rights of all human beings. It exists as truth, because God made it so. It came from God’s nature and plan for the unique and diverse nature of the people He created. He knows the number of hairs on everyone’s head. When individuals or a group of people create their own law to override this law; they lose the God-given sense of their own humanity—dehumanizing others and inflating oneself. They become their own gods; making themselves as greater than our one God. In dehumanizing others, they violate the rights of others. When average people start to listen to such lies and deception, they can start doubting their duty of “being our brother’s or sisters’ keeper.” When a society fails in its moral duty to help each other in times of need; that society is doomed to fail. Sadly, TPLF/EPRDF opponents have overwhelmingly adopted the same ideology; none of which is right or moral according to God’s universal laws. When they speak about justice, it only means their own justice. When they speak about double-digit economic growth, it only applies to them so they can thrive while others struggle to survive. When they talk about security and protection; it only means their own. The perks and opportunities are only for them—not for others. Everything they do is in opposition to God’s universal principles.When these are broken, there are penalties and consequences that result that impact not only themselves, but also others. The only way now to get out of this is for people to go back to God and His God-given principles—to reject the destructive principles by which we are now living. It is the right thing to do because no living being can exist without depending on others, from birth to death—others help meet each others’ needs. When we talk about human rights, it cannot be separated from God and His principles. It will not work. Human beings are diverse, but at the core we share our humanity, a gift from God. No one can take it away. It surpasses any other differences.To bring human rights violations to an end, we must put humanity before ethnicity or any other distinctions. This means to care, protect and respect others and their property and lives. Our survival depends on each other for no one is sustainably free until all are free. It is now up to those who still have their rights, especially those of us living in free countries, to advocate for others who have no voice and who cannot defend themselves. We cannot pick a small section of our identity and forget about the much broader category of being human. We sometimes have to focus on smaller groups, unique distinctions, and issues with which we are most knowledgeable, but it should not exclude others. We can create institutions that speak for individual needs, regions and special interests, but when we want perks, opportunities and power for our own groups, the same should apply to others seeking it. I must say that Ethiopian Muslims have set in motion the foundation for what we are talking about today. I have heard you speak out in behalf of other Ethiopian religious groups and ethnic groups. Today, you asked me to include all Ethiopians in this talk. This is what we need to build a new Ethiopia. This is what we need to starting talking to each other and building relationships rather than talking about each other and creating misunderstanding, alienation and separation when we could find out how much we shared in common. Imagine an institution that educates, empowers and organizes Ethiopians to support rights for all. This is how the cooperation of diverse Ethiopians will bring something much broader and more powerful. Such an institution begins by talking to each other rather than about each other. I urge you to continue to reach out to form new and stronger relationships and to support others. Be the voice that speaks for the freedom and humanity of all. Help bring truth, freedom, justice and transformation to a society that has forgotten what it means to be created human by our Maker. Without a transformation of our thinking; unrest, conflict, destruction and death will threaten the survival of all of us as well as the survival of our nation. What this country needs is for national soul-searching. As we struggle to bring human rights to Ethiopia, let us remember that it is a worthy effort to struggle for a more loving, just, and humane Ethiopia for all where people are free to live their lives. Let us join hands and bring reconciliation to the people of Ethiopia and beyond, for our survival depends on each other.